We are the leading organization in the market to provide our customers with the best set of Volleyball Uniforms. The offered uniforms are designed using high-quality fabrics and advanced machinery according to with the set industry norms. These uniforms are highly appreciated among our clients for their perfect finish and tear resistance. Keeping in mind the specific needs of our clients, we provide these uniforms in various sizes. We supply a wide assortment of Sport Wears, which is manufactured from premium quality raw material. Our range is comfortable and thus, highly demanded by the players. 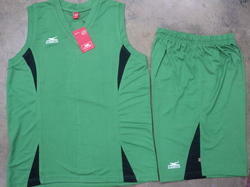 We also offer sports wear in customized dimensions as per the clients’ demands. Our range encompasses tracksuits, soccer jerseys, jogging pants, swimwear, sports tees and other sports garments. In addition, the sports wear offered by us is sweat absorbent and is available in various colors.